Recently we’ve been working to finish off and land the last couple of fixes to get a perfect pixel-for-pixel match against the reference Acid3 rendering in WebKit/GTK+. I believe we’re the first project to achieve this on Linux — congratulations to everyone on the team! We also recently announced our plans to align more closely with the GNOME desktop and mobile platform. To this end we’re making a few technology and organisational changes that I hope to discuss in an upcoming post. Sweet! Will it be in Hardy backports? I really want to have a browser on my machine that passes ACID3. Such a tease. It looks awesome and all but we won’t be able to get a package before six months or so (maybe more). I don’t know about you but I get a lot of warning about missing body parts. Patrys: You need to pass –enable-svg-experimental to configure, and also make sure you’ve _fully_ cleaned your build tree if you had an old build around, since the build system gets confused sometimes. Let me know if there are still issues after doing that. Thanks, cleaning the whole directory helped. Now I’m tracking a bug that causes Epiphany to crash if WebKit uses Pango for layout. Here webkit crashes so often… Both nightly and trunk. I got it compiled without any problems at all, and I’m very impressed with it so far. Gradients work great with RGBA color. It’s pretty awesome to be able to make divs with semi-transparent gradient backgrounds and rounded corners using CSS. Mandriva now includes a WebKit build capable of the above rendering (32531 , with –enable-svg-experimental , and also the Mozilla plugin patch). The Midori browser is available as a package, and Epiphany can be rebuilt with the WebKit backend just by flipping two settings in the spec file. The 100/100 WebKit build is already in Cooker (development branch) and I’m now sending it to /backports for 2008 and 2008 Spring (the last two stable releases). Congratulations to the WebKit team for this awesome work! 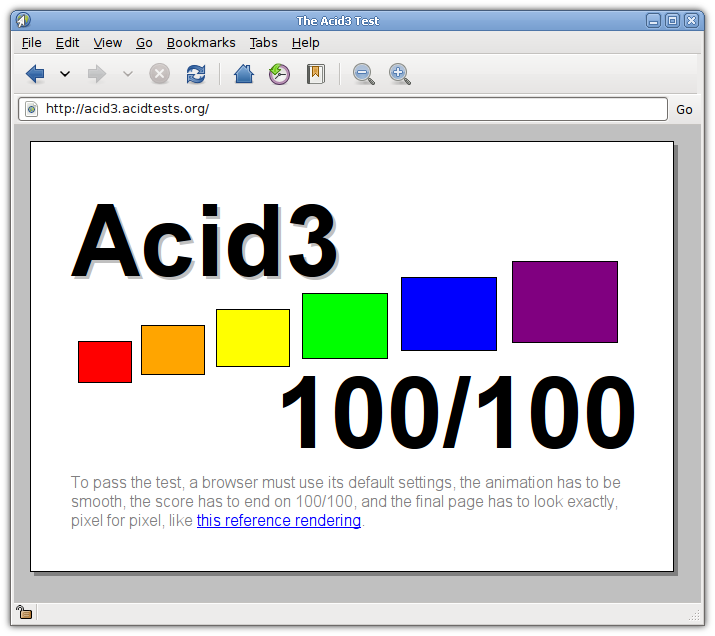 WebKit passed Acid3 fully for the first time on Friday. So it’s 100 subtests of 100 passed now. Opera 9.60 Beta scored 85.